For many years I have argued that the solution to high health care costs with universal access is “Single Payer” with “Private Providers”. In other-words, the government collecting taxes from everyone for prescribed services though provided private health care companies that compete for those dollars through their own hospitals, clinics, home care… . And before you get your twitter-rage up, yes, I know that “prescribed services” is a particularly thorny phase that will cause many to recoil, but I think we can all agree that as heart breaking as it may be governments (i.e. you and me) cannot collectively cover EVERY treatment. Also note that I am not saying the Federal Government should set a fixed fee schedule. In a competitive market those private providers will provide increased service at reduced costs. 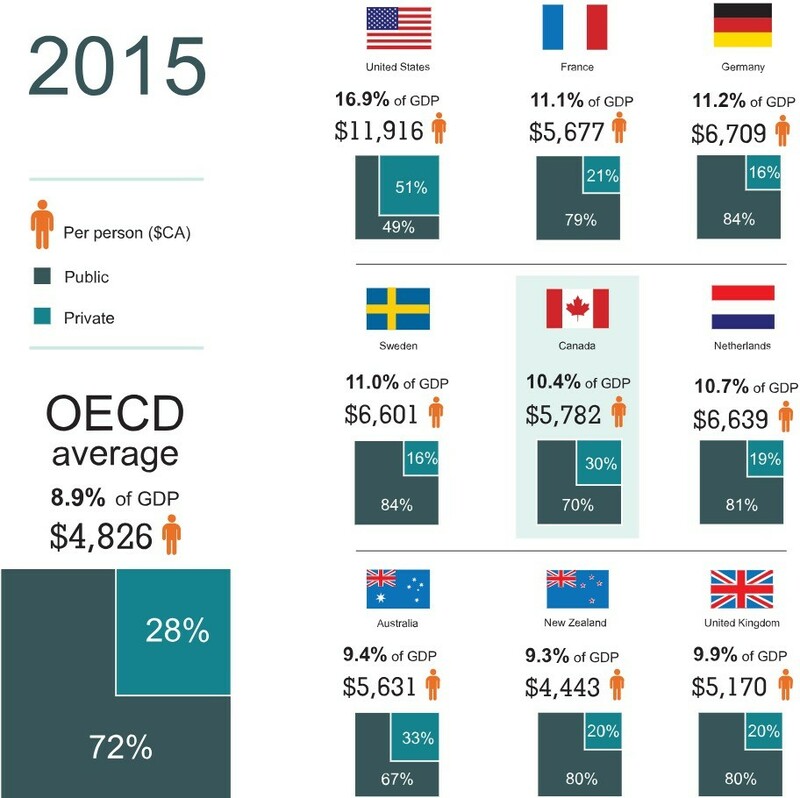 For your reference, the graphic to the right shows the amount of money spent or each citizen in 2015 Canadian Dollars and what that represents as a percentage of Gross Domestic Product (GDP). The American “User Pay” health care model leaves too many people out and is it is just too expensive. To be clear, in my OPINION (and I know some will disagree so I want to make my bias clear), no-one should die or live pain pain just because they are poor. So if you want a tummy tuck or a face-lift, enjoy paying for it yourself, but if you have a heart condition or need a broken leg worked ond, society should help. It is estimated that about 12% of Americans do not have health insurance and a great number of those with insurance cannot afford to pay the average $4,358 deducatable /co-pays. Take a look at the table to the right. 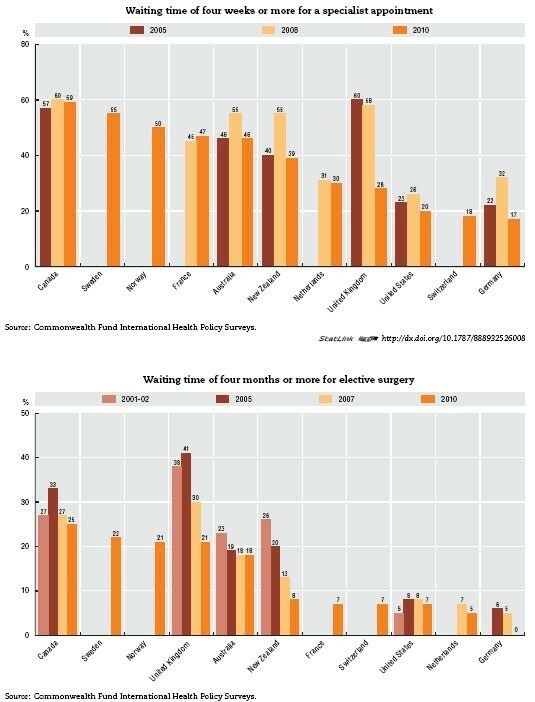 It shows the average wait times in Canada, Sweden, the UK, the US and many other countries. It is plain to see that the UK ad Canadian systems are failing their citizens despite increased spending and a never ending stream of claims from health care boards and politicians that these wait time will be reduced. Moderate Left – Canadian ‘NDP’: We will work with the provinces to establish a universal prescription-medications insurance plan – saving billions from health-care budgets – and immediately create an independent Pharmaceutical Research Council to ensure that research dollars are spent in accordance with expert-driven, patient-centred research priorities. In the end, all three groups attempt to placate the public by spending a lot more money to not get very much more done. This is just ‘kicking the can down the road’ to future generations to both fix and pay off the massive government debts being accumulated to pay for health care. “…There is nothing economically mysterious about health care — it is just another service. Like any other it can be plentifully provided on a free market at affordable prices and constantly improving quality. But like everything else, it breaks down when the central planners get their hands on it, which they now have. To claim that the problems are due to a “market failure” in health care is like saying that there was a market failure in Soviet bread production. …The bureaucracy of a public healthcare system cannot use market prices to allocate resources. It must use some other means. First it will try to plan according to estimated demand. It will try to guess the number of bone fractures, open-heart surgeries and kidney transplants in the coming year. The estimates will invariably be wrong, causing shortages in some places and overcapacity in others — at the same — which translates into human suffering and economic waste. The reasonable fear here is that private health care companies can easily become too powerful and need an equally powerful counter force (law, regulation, oversight, single payer…) to counteract their otherwise good intentions. I argue that single payer is the least evasive of those remedies. In a complex world with many competing interests there is no one simple answer to the question of how to “fix healthcare” but there are definitely some large scale changes that will help. We need to do something beyond spend more money and hope that future generations will come up with a magic bullet. Put simply: In the real world, the free market needs some regulation and the socialist model is a formula for increased costs with decreased services. Single payer / private provider just make sense… does it not? I would very much like to hear your responses to this but please hold the political vitriol and the one-off examples to a minimum.